Having been inspired by fellow money blogger Mrs Mummypenny I’m today wanting to share with you some of the best financial investments I have ever made. 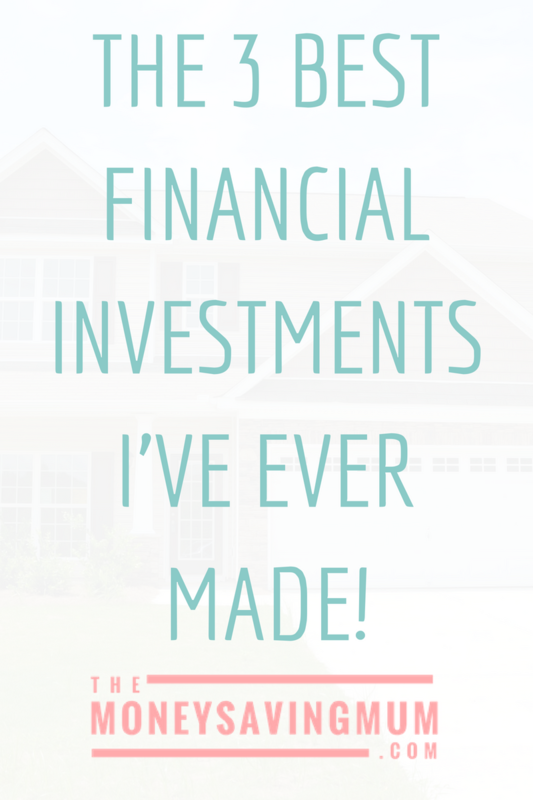 I love reading these type posts; they really give me some fab ideas and even make me rethink things that I’ve maybe invested in but either haven’t yet seen the immediate benefit from yet or not actually looked at it as an investment! Now I’m 32 (just!). Some might say I’m not as ‘experienced’ as some in life but let me tell you money-wise….. we’ve had money, we’ve lost money, we’ve had wages reduce dramatically, redundancy AND a dismissal (because they were corrupt by the way!) so I think I’m in a pretty good position to talk about personal financial planning. 21 years old I was when I bought my own house with my now husband. That was 100% the best investment we have both ever made! We needed minimal deposit (just 5%) and bought before the dramatic price increases in both house prices and deposit requirements but don’t forget this was in 2007! Also we took out the mortgage over a 35 year period reducing the term down every time the fixed rate was up for renewal. The amount we pay now is the exact amount we did back in 2007 and we have around just 10 years left to pay! That might not be possible for these days I accept that as we did buy at probably the best time and our original interest rate was over 6% but getting our mortgage over a long period of time initially and then overpaying every month since 2012 is something that helped us out both at the start and helped us out even more come 11 years later. We were both working full time in relatively good paid jobs (then!) so instead of renovating every single inch of the 3 bedroomed house we chose to add another room and convert the loft to a liveable space. We knew this was going to be our forever home so we invested in it while we had the money and decided to extend. If we were to do it now I anticipate it would cost a hell of a lot more than just the £4k it was back then! And although it’s not to building regulations, 11 years later it is now my 7 year olds bedroom and we have a spare box room. Another absolute must as far as an investment is artificial grass. It was expensive and completely unknown 10 years+ ago but we got our first dog not long after we moved in and after going through I think two lots of turf, green/dead/wee patches we opted for ‘fake grass’. There’s no mud, the kids can play outside when it’s been raining, we can hoover it, brush it, disinfect it and more importantly not kill it with the now 3 dogs of ours having gone to toilet on it! That was something again we got prior to kids and one of the first things we invested in when buying our first house. We’d probably would still have the exact same grass down now if we hadn’t have extended the downstairs a few years ago but the builders left it in such a state we had to replace. Whilst on maternity with my eldest during 2011 I decided to take it upon myself to start my own cake business. I had reduced my hours at work to avoid extortionate childcare costs and no longer had access to the full time pay I’d had for the previous 5 years. I had time and I needed money. Any money I made went straight back into making bigger more extravagant cakes for very little profit just build up a portfolio. I don’t regret this whatsoever because it allowed me to gain experience in both being self employed, running a business and obviously being a cake decorator. However the time I spent on the business and in the kitchen was to much. Way to much! In 2013 hubby took redundancy from BAE Systems and whilst the majority of the pay out paid for our wedding in Florida in 2015 he gave me £1000 to invest into my business. I ventured into the wedding industry and bought new cake stands, a sweet stand he even made me the cutest child candy cart that I could hire out in addition to the baking the cakes/cupcakes etc. Unfortunately not long after my youngest was born my hubby, now in another job by the way, ended up having to go onto shift work. This meant I no longer had the weekends free to take cakes to venues or to do chair covers or even drop off our LOVE lights to Saturday night wedding parties because I now had two children (and a tiny Fiesta!) to look after pretty much on my own. Things were going really well but it just wasn’t meant to be. From dealing with hotels/venues, public liability, customers/clients, contracts and invoices; I was on it like a car bonnet and learnt so much of my social media skills from running my own business. I still have a lot of my stuff in storage to be fair; slowly selling things off as and when I get around to it. Hubby still works weekends now so most things are just gathering dust but looking back just having that £1000 taught me so much and probably wouldn’t be where I am today without it. Previous Post I’m in recovery! Next Post Center Parcs…. on a budget! I love reading about big investments other people have made! Now I never would have guessed that artificial grass would be in your top 3 best decisions!! Not having boys or dogs I have no experience of what they can do to a lawn, but I’ve seen the results of boys and back garden football so can understand. Wow, brilliant experience from your businesses. Hope it stands you in good stead for your blog. Amazing what a difference overpaying your mortgage has made too. Thanks so much for joining #MondayMoney! Yes to starting your own business!! So worth it! Thanks for linking up to #MondayMoney. Hope to see you again next week. I love the fact that you have so much experience at such a young age! You are definitely able to give advice to others. I imagine much greater things coming from you in the future! Thanks for sharing such an inspirational piece.